Everywhere I’ve lived (all in or very near the southern Appalachians) there has been some feature of skyline that has oriented me to where I was in the world, some high and prominent rocky fold or spire on the skyline that tells me I am exactly here. High places orient us. Perhaps, too, it is the sense of permanence that we draw from when we “lift up our eyes unto the hills from whence comes our strength” as the Psalmist said. We are drawn to that which we can see from anywhere while the stories of our lives unfold, as if those high places look down on our petty problems, seeing them in the perspective of the ages, putting our month of despair or sorrow into the context of their million years of uplift and erosion. We gravitate towards skylines with character. In this part of the world, we feel the gravity of mountains, and if we don’t live on them, we want to look at them. But there can be places where so many want to see one of these beautiful mountain landscapes or high prominences that over time, the decks and picture windows and vaulted glass walls of one new home look out on the decks and glass walls of the next and the next. And in the end, the charm and character of the landscape is lost. Precious places can become prostituted to profit, turned into a mere selling point, and priced out of the experience of those whose lives have been told in the shadow of these special places for generations. You yourself can buy a piece of Floyd’s unique skyline and own the Buffalo lifestyle. It’s simple. Sign here. Scroll down to chose your view. Beautiful green ridge top parcel with grandiose four-season view of Buffalo Mountain. Strong western mountain views with neighboring orchard and nature conserve canopy. Views to the east include nearby mountain range. Quiet cul de sac with level building envelope offers exceptional plan diversity. Community panorama and four-board fencing complement the Buffalo lifestyle. 2.55+ acres. $615,210. The pull is strong. And expensive. And in not many more generations, the view–of the Norhteast coast, the Rockies, the Pacific Crest, the Grandfather Mountains of the east–may be owned only by those few able to pay for it. How do we decide as communities what is precious, even in what we see from our back roads and living room windows, and then, how do we protect those high places so our children’s children don’t look out on roof tops and swimming pools, strip malls and cell towers? How do we keep these grand hills from becoming grandiose, protect our special places from becoming more than mere commodity, and nurture them as a source of solace and strength long into the future? For starters I would not invite anyone else to live here through adverts. More importantly, communities wanting to save the area must be willing to purchase said land either through higher taxes or privately. Perhaps the biggest driver of construction is employment in the region, so the less economic growth a region has then the less likely it will be developed. I had to laugh at the Buffalo Estates because I too thought it was pricey given that it is Floyd county and you get less than 3 acres with a pretty standard house. In fact, a big reason to move to Floyd should be to get more than a few acres and not to live on a cul de sac. developer’s are some of my least favorite people! western NC is getting to be like you said- almost to the point that every hill or ridge has a house sitting on it. just recently, the ridgeline view from my parents house changed from trees to a barren ridge with monstrous houses dotting it. and the sad thing is, most of the houses built belong to part-time residents- so they changed the landscape and view for hundreds of people just to have a vacation home. little thought goes in to how a development affects the community and view for the locals. it’s very sad and frustrating. That price is insane. Are people actually buying those parcels? Groundhog Mountain is gorgeous, just like Cahas Mountain over here in Franklin County, but NO ONE I know is paying that kind of coin for 2 acre parcels, except at Smith Mountain Lake. For not much more than the price of that 2 acre parcel I bought 38 acres with one of the best Cahas Mountain views around. And my 39 acres came with a 7,000 square foot house on the hilltop! And a horse barn, a storage barn and a riding arena! 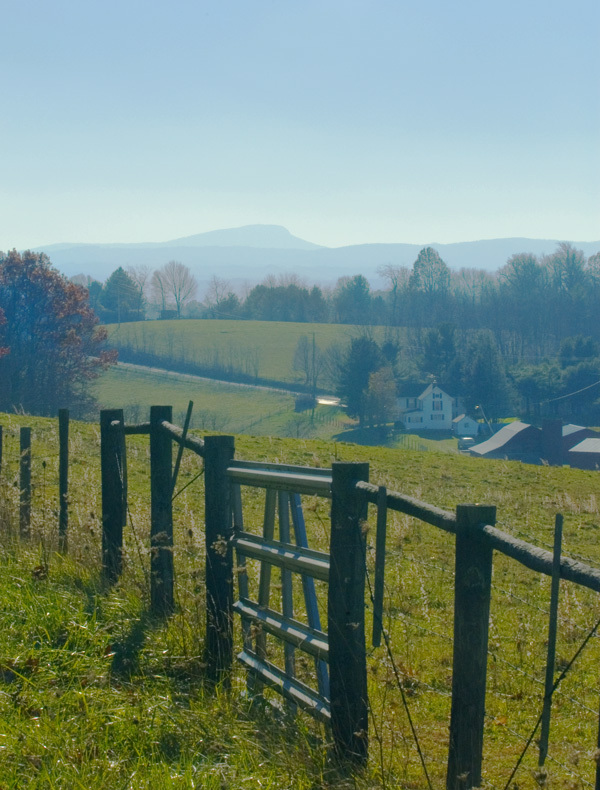 For Sale: Franklin County, VA, equestrian estate. 74 Acres, House, Horse Facilities. All for the low low price of sixty million dollars. Har har. When you figure it out, Fred, let me know so I can jump on your bandwagon. We found the area around Floyd Co. to be pretty pricey when we were looking to buy. We were fortunate to find our home on (and Sean, as usual, got it spot on)beautiful Groundhog Mountain. In our community present homeowners are buying up the vacent lots in an effort to keep the building to a minimum. Even so in the year we have been here four new homes have gone up. And two ajacent lots 1 1/2 total acres,with the view, sold recently for $60,000. Fred the picture you posted is the road to my place. where is this Buffalo Estates located. please tell me not there! !